It’s no secret that Japan is the country of vending machines… but this is new: Tokyo-based beverage company Asahi Soft Drinks took the wraps off a vending machine that not only offers drinks but also sends out Wi-Fi signals within a 50m radius. What a perfect compliment to Coffee in a Can! Now you can serf the internet while drinking Wanda Wonderful Coffee. The first is always tasty. Entry filed under: Uncategorized, Videos and Articles. 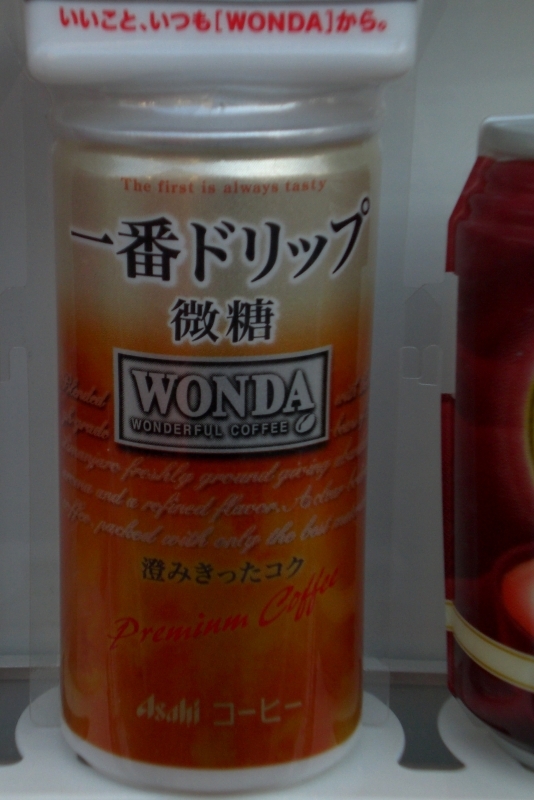 Tags: Coffee in a Can, internet in a can, Japan, vending machines. That’s pretty cool and a good marketing ploy. Japan is just so cool and leading the way once again. That’s pretty great. I feel like I’m spoiled with Wi-Fi in Minneapolis. When I went to Chicago it was really hard to find free wi-fi. There was no free wi-fi in Japan – everyone appeared to have a private carrier. But in China, there was often free wi-fi – or at least the free with your drink type. Communists! I wish this had been in place when we visited! No doubt Asahi would have profited from our coffee in a can addiction. Japan used to be world renowned for it’s high quality products. Now it is popular for it’s techno advances. I love all the crazy machines they make. I hope they use a lot of solar or wind power though. It seems like all that high tech stuff would really pollute.